An Amazing WW2 Survivor that Served into the 1970s! His Majesty's Mk3 LCT 318 was built by Teesside Bridge and Engineering Company and launched on February 14th, 1942. She was 192 feet in length and 33 feet across her beam and could carry 5 tanks or 350 tons of mixed cargo. Her armament comprised two 20mm Oerlikon guns and her crew complement, including her commanding officer and his second in command, was a total of 12 men. This is the story of one Landing Craft Tank seen through the eyes of the craft's electrician. This class of vessel was designed for frequent but short duration journeys across the English Channel or similar stretches of water, so living accommodation was not a major consideration in its design. 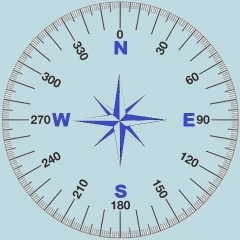 However, in practice, we lived under quite dreadful conditions for years, especially when operating in hot climates, which we sometimes did in the Mediterranean when there were few modifications to alleviate our misery. Later Mk3 'Star' LCTs sent out to the Far East were more suited for purpose and far better equipped. These LCTs bore pennant numbers in the 7000 series and had a crew complement of nineteen men. The grossly overcrowded living space caused excessive condensation which, at night, required hammocks to be covered with waterproofs to prevent the blankets becoming soaked. Not surprisingly these unhealthy conditions caused or exacerbated chest ailments and tuberculosis, which were rife amongst LCT crews. The galley was adjacent to the officers' quarters with its coal-fired cast iron stove, that an imaginative person might liken to a very crude Aga. Hot water came from a 4 gallon tank attached to the stove, which was intended to cater for the crew's needs. The nearby coal bunker served as a top on which all the meals were prepared. There was no official cook amongst landing craft crews, so the author assumed the role without any training. He continues with the story of LCT 318. 318 was commissioned during March/April 1942 and was assigned to the 4th LCT Flotilla under her commanding officer, Lt Green. She was thought to have been involved in the infamous Dieppe Raid in August 1942 but details were sketchy and not worth recording here. 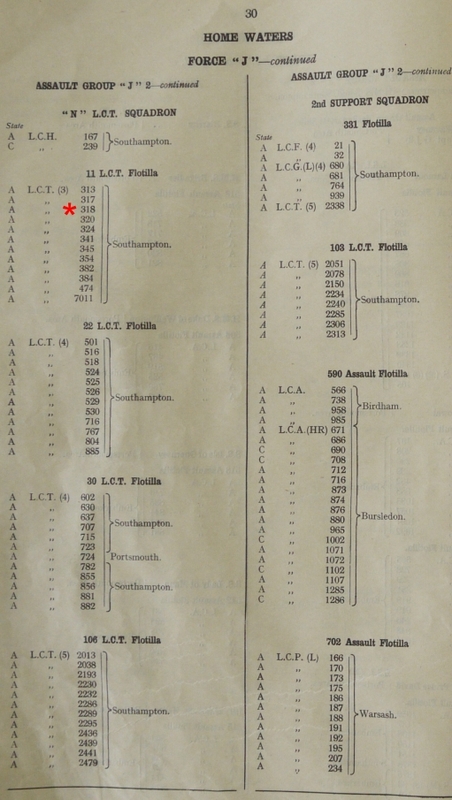 Our crew joined LCT 318 in March, 1943, while she was docked at Southampton. She was part of the 11th LCT Flotilla. We were transferred from Scapa Flow, where we had been providing protection for capital ships. The protection involved rigging steel anti-torpedo nets on to Mk3 LCTs, which were then moored alongside the larger vessels. The nets were then lowered into the water to give protection to our ‘Big Sisters.’ In providing the ring of steel for the larger ships, it seemed landing craft and their crews were regarded as expendable by the top brass! In April, 1943, LCT 318 and her sister ships of the 11th Flotilla sailed with another flotilla to Gibraltar. The journey took ten days and was not without incident. The flotilla navigator executed a 90 degree turn at midnight on a moonless night, no doubt as part of an anti submarine strategy, but one LCT did not see the signal. In a three column formation, a collision during such a manoeuvre was almost inevitable but, fortunately, the sloping bows of the two craft involved, allowed one to ride up the side of the other and, after some delay, the two craft disengaged and we continued in convoy. We arrived safely in Gibraltar, our arrival being duly reported by the Germans and by the Daily Mirror, much to the relief of my parents. In the following weeks, we collected a variety of cargoes from numerous ports on the North African coast, as we made ready for Operation Husky - the landings in Sicily. We also made trips to Malta, often courting the attention of German and Italian fighter planes. Many landing craft suffered fatalities from air and submarine attacks. In July 1943, LCT 318 and her sister ships loaded at Benghazi. We embarked men of the 99th Light Anti-Aircraft Regiment and set sail for Malta, where the invasion fleet had assembled. The onward journey to Sicily was memorable for a dreadfully sad spectacle, which we witnessed as we approached Sicilian waters. We were not involved in the initial assault, so we had a grandstand view of the unfolding events from a relatively safe distance. We witnessed Allied gliders crashing into the sea, after inexperienced American pilots released them too early when they came under enemy gunfire, which probably included some from our own guns! I also recall a hospital ship being attacked, even though she was well away from the invasion fleet and fully illuminated. When 318 eventually beached, she discharged her troops at Avola (Green Beach). The men landed dry-footed and met little opposition. We then ferried POWs to captivity, including some Italian troops wearing their pajamas. They all had the presence of mind to pack their bags! 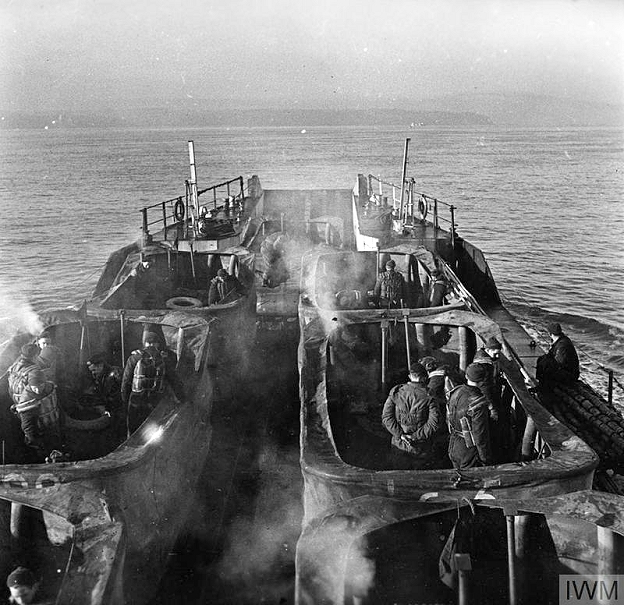 We then engaged in ferrying munitions and supplies from cargo vessels to the shore as we followed the Allied advance northwards along the coast of Sicily. On the 3rd of September, 1943, we embarked lorries and miscellaneous war materials at Messina and ferried them to the beach at Reggio de Calabria. The army had shelled the area around the landing beaches from across the Straits of Mesina with the Air Force in support. Enemy resistance on landing was, consequently, fairly light as the Allies harassed the retreating Germans. One such example was at Vibo Valentia where the landing started quietly but, when a German Armoured division arrived on the scene, it caused quite a bit of trouble. 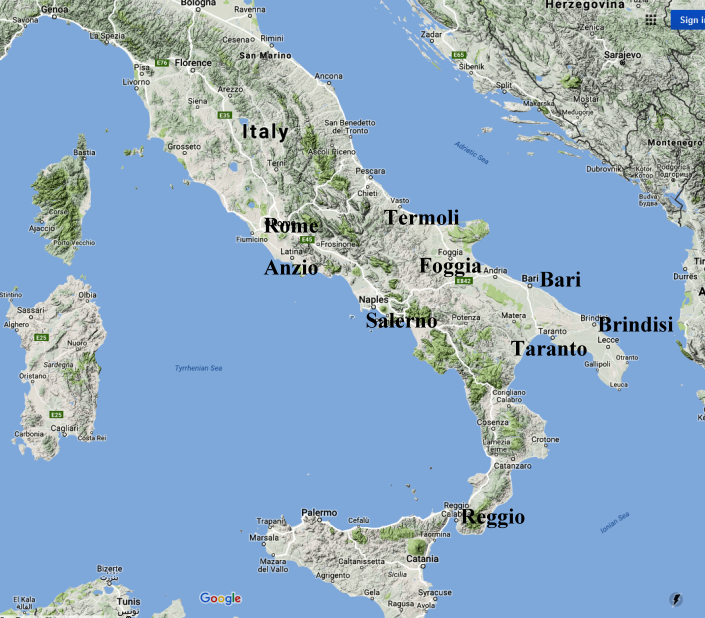 In October of 1943, when in Taranto, we were recalled to our base in North Africa. On arrival there, the backlog of repairs requested over several months were finally completed, after which we took passage to Algiers with our base staff, where we stayed for several days. Such was the secrecy about our next assignment that speculation was rife, the most likely outcomes being home or the Far East. Fortunately for us we were homeward bound. 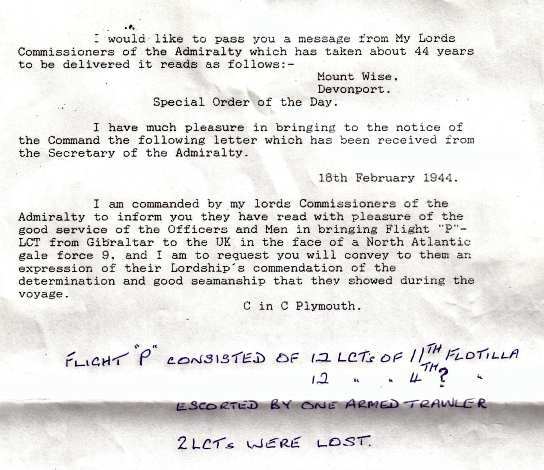 In November 1943, we arrived in Gibraltar where we replenished our stores and spent our accumulated pay on luxuries that were not available back home. We set sail for England on the 3rd or 4th of November and proceeded westwards into the Atlantic to avoid submarines in the Bay of Biscay. The first five days were calm but, for reasons unknown, we proceeded at a very slow pace. On the sixth day, we encountered Force 9 gales and our convoy of twenty four craft were scattered. 318 found herself alone and without radio contact, owing to storm damage. The seas were mountainous with waves of 30 feet or more and substantial damage was caused. The fuel pumps on both main engines ceased to function and we had to resort to hand pumping fuel to the engines using the semi-rotary pump, which was normally used to prime the engines. This arrangement continued for the remainder of the five days and nights it took us to arrive back in England. We had no radio, no modern day navigation aids and no opportunity to take sun or star readings because of the cloudy weather. Throughout that period the 318 was totally lost! We headed in the general direction of where we thought England should be. The gale continued to blow and our concerns grew as the stove began to disintegrate, making it increasingly difficult to make hot meals and drinks. On or about the ninth day out from Gibraltar, a Sunderland flying boat on anti-submarine duty discovered us and set us on a course for England. At dusk, on the tenth day, still struggling through the storm, land was sighted. A suitable beach was identified and, in near dark, we ran up the beach at full speed. The crew of 318 collapsed from exhaustion and the next morning we discovered we had landed on St Marys, one of the Isles of Scilly. We were later joined by another four craft, which had been escorted in by the naval unit based on the Islands. We remained there for about two weeks, being pumped out and undertaking emergency repairs. When the high spring tides came, we re-floated and made our way to Swansea for repairs. The ship manager later reported that rivets ‘by the bucket full’ had been recovered from the double bottom and that if we had been a welded craft we would not have survived. Let me here give thanks to the builders at Teesside who did such a marvelous job in the construction of 318 which likely saved our lives. Sadly, two of the craft that sailed into that storm did not survive the journey. We departed Swansea in February 1944, via Cardiff, to have the compass swung and the degaussing tested, arriving in our home port of Southampton, where we were joined by our sister ships of the 11th LCT Flotilla. They had all been undergoing repairs at different yards, mainly in the Liverpool area. A period of flotilla training or ‘working-up’ followed, after which we returned to Portsmouth, where we were to have Mulock extensions fitted to our ramp. We later discovered this was to accommodate a new ‘secret weapon’…the Duplex Drive Sherman tank or ‘swimming tank’ as they would become known. T hese tanks had been fitted with a waterproof canvas skirt, which allowed them to disembark at sea and then ‘swim’ for the beach. Manning the Sherman DD tanks were the men of the Canadian Fort Garry Horse. On D-Day, the DD tanks were intended to be launched two miles off the beach, thereafter, they would make their own way to the beach, lower their canvas skirts and then engage the defenders. Such a sight would likely have a demoralising effect on the enemy, whilst providing significant back-up for the incoming assault infantry. Much has already been written about the uncomfortable journey across to Normandy on June 5th/6th. Suffice to say here that the seas were rough at Bernieres sur Mer on Juno beach but the men of the Fort Garry Horse were landed dry footed. 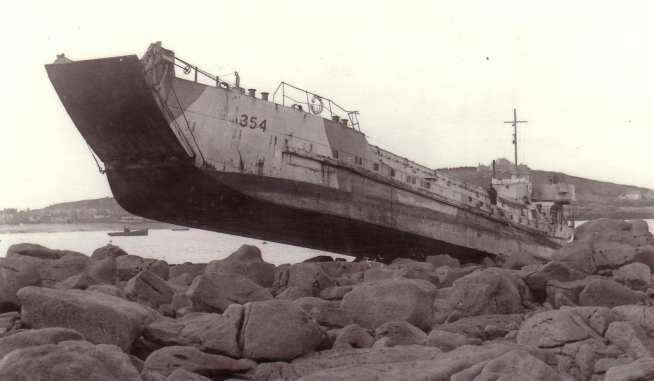 LCT 318 ran directly onto the beach to discharge her tanks but there were problems. Enemy gun and mortar fire was quite heavy as we made our final dash and just short of the beach, the stern of the craft forward of us swung round and collided with our bow, causing damage. With a solidly jammed bow door, none of our 30 ton tanks could disembark but when the front-most tank pushed against it, it gave way under the extreme pressure. Despite the heavy enemy response to our arrival, we avoided major damage but two craft from our flotilla were lost and they took casualties, notably two men killed aboard our sister ship LCT 317. We withdrew from Juno beach to a safe distance, while on call for other tasks if required. We spent the remainder of the day cruising offshore, while the beach-head was secured. For several days following, we ferried a variety of cargoes back and forth between England and France. 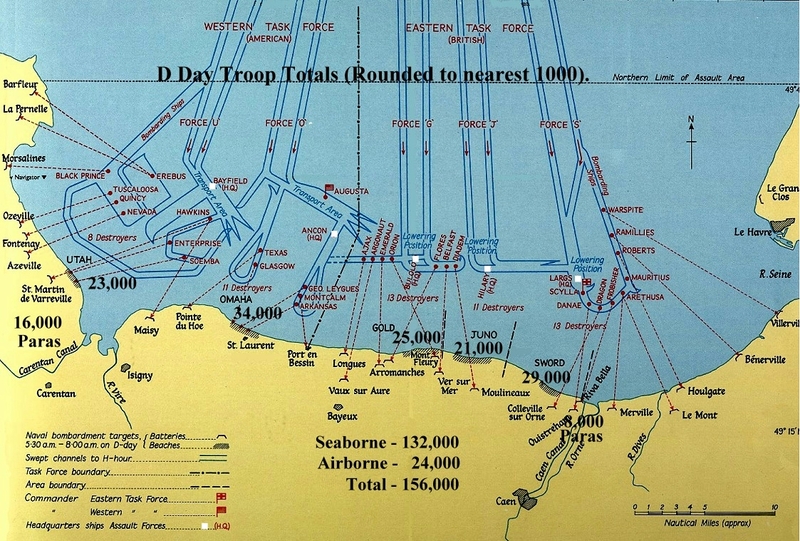 On one such trip back to Normandy, 318 embarked American troops for Omaha beach. On the journey, the weather worsened and we were soon in the grip of a full blown gale. We anchored off the beach, hoping to ride the storm out but we lost both Kedge anchors and both engine sand traps became clogged, resulting in the loss of both engines due to the lack of coolant. We drifted against the floating roadway connecting the Mulberry Harbour to the shore and regretfully sank many of their supporting barges. The 318 was at the mercy of the sea and was finally washed up on to the beach…..we were helpless to prevent it. 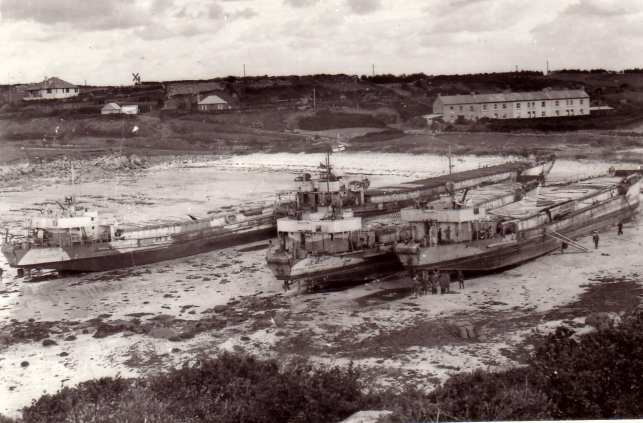 There were hundreds of landing craft lost or damaged during the great storm that raged for three days beginning the third week of June. We lay helpless on the beach for a week or 10 days until essential repairs were carried out by a beach party to make her seaworthy. In that period, we had repaired the engines and were able to limp back home to Southampton. 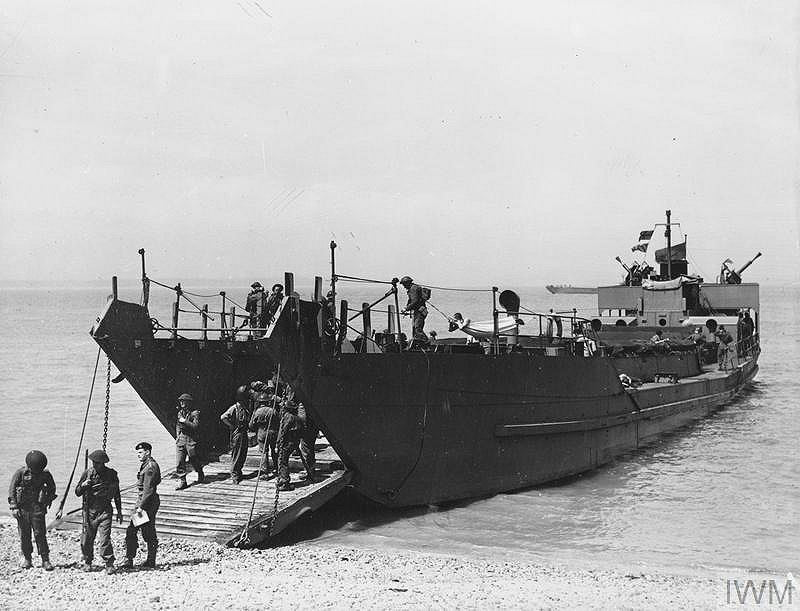 The planners had anticipated far greater losses amongst the landing craft during the Normandy landings, so crippled or damaged craft like LCT 318 were dispensable. She was laid up and we, her crew, were paid off. My association with His Majesty’s Landing Craft Tank 318 had come to an end. I spent the remainder of the war in the UK, which included a very cushy number in Poole Harbour looking after American Lend-Lease craft awaiting repatriation after the war. 318 was subsequently converted to an Engineering Repair Craft designated LCT(E) 318 and beyond that to Maintenance and Repair Craft 1097. I suspect she was intended for duties in the Far East but have failed to discover if she arrived there. One of her sister craft LCT 320, also built at Teesside and assigned to the 11th Flotilla on D-Day, became Naval Servicing Craft 1110 attached to the submarine depot ship Medway supporting the 10th Submarine Flotilla out of Singapore. On the subject of what happened to LCT 318, John Rowsell provides the following information. 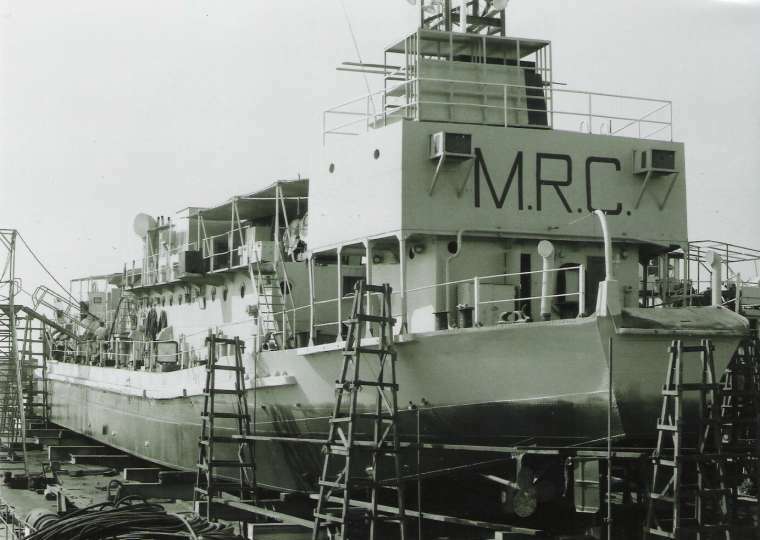 My understanding is that LCT 318 was refitted to serve as a Maintenance and Repair Craft (MRC1097) - as James explains in his story. I know that in the early 1950s she was based in Malta, was in the Suez operation in 1956, and turned up in Bahrain in 1962 as base ship for the 9thMSS/MCMS from 1963 (I think) to 1971. I served on board her for 2 years in 1966/67 as a Tiffy. Little did I know then what her story was. I believe she was sold out of the RN in 1971. LCT 318 was an extremely lucky craft. We only ever sustained three casualties, none was fatal and only one was due to enemy fire. If the stoker in question had remained at his station in the engine room, he would not have been hit by a piece of flying shrapnel, which severely injured his nose. However, it should be remembered that many similar craft, and the men who served aboard them, did not survive the war. Thank you for reading my personal recollections. By doing so, you have helped preserve the memory of those who served their country at a time of great peril. This account of the Mk3 LCT 318 is by Wireman (Electrician) James B Routledge D/MX 95943. Unless otherwise credited, the photos were also provided by him. 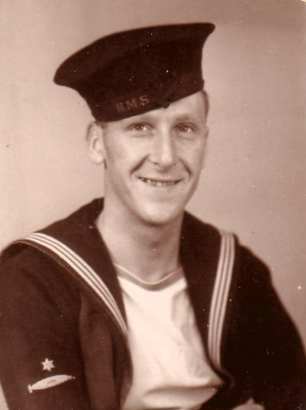 Transcribed by Archivist/Historian Tony Chapman of the LST and Landing Craft Association (Royal Navy) from information provided by James and further edited by Geoff Slee for website presentation, which included the addition of maps and photographs.